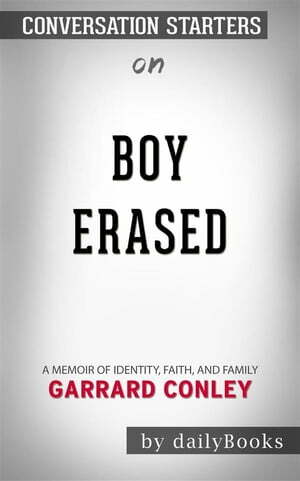 Collins Booksellers - Boy Erased: A Memoir of Identity, Faith, and Family by Garrard Conley | Conversation Starters by dailyBooks, 9788829573790. Buy this book online. After nine days in an ex-gay therapy program, Garrard Conley knew he could not be part of it anymore. He was suicidal as he left the program. The counselors impressed on the gay participants of their sinfulness and their need to be fixed. His mother admits later on that it was a mistake to make him attend the conversion program. He grew up with Missionary Baptist parents who believed deeply in the Christian faith, but being gay was a sin and was not considered acceptable. The book exposes the intolerance that exists today when people confront the issue of gay identity and sexuality. It is also a story about love, identity, and understanding. One of the top nonfiction books of 2016, the memoir Boy Erased is now a movie written and directed by Joel Edgerton with Nicole Kidman, Russel Crowe, and Lucas Hedges in the lead role. The book was a nominee for the Lambda Literary Award.